’18 F-150 RAPTOR: FORD’S TWIN-TURBO SUPER TRUCK! 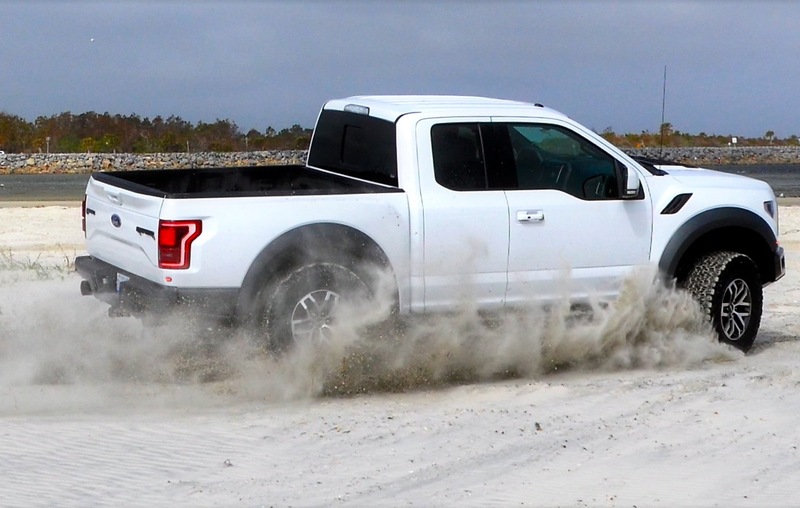 Dan Scanlan introduces the Raptor – Ford’s Gen II ultimate pickup-truck to Florida’s wind-whipped dunes, water-covered mud flats and the open road. Ford Performance has had a hot rod truck before – the 1999 to 2004 F-150 Lightning. 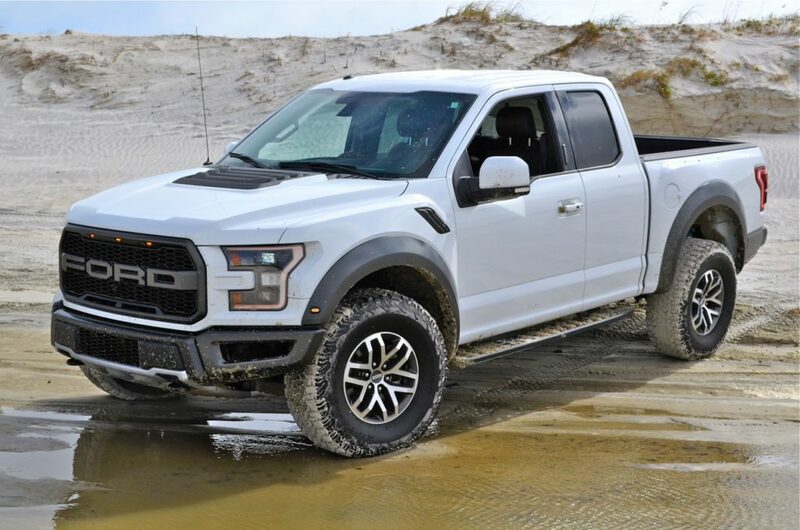 But it had nothing with horsepower and off-road macho until the Raptor’s first generation began prowling in 2010 with a 6.2-liter V-8 and 411 horsepower. Now Ford’s F-Series has an aluminum superstructure and body, with turbocharged V-6 engines. So the redesigned ’18 Raptor, Ford’s Twin-Turbo Super Truck, gets two less cylinders, while retaining its teeth. The new 3.5-liter EcoBoost V-6 has 450 horspower (39 more than the last V-8) and 510 pound-feet (76 more) of torque for a 22 percent improvement in torque-to-weight ratio. There’s also a new 10-speed automatic transmission. It’s housed in a more aerodynamic body that’s 500 pounds lighter. It counts- in rear-wheel-drive and “Sport” mode for more dramatic throttle response and quick upshifts. Our Raptor jumped off the line to hit 60 mph in 5.2 seconds, transmission rapidly firing off shifts as the V-6 growled. The acceleration was addictive, with easy to use paddle shifters. Still, with 10 speeds, there didn’t seem to be much difference as we tapped down a few sometimes to get where we wanted. We also had some abrupt downshifts. We saw a consistent 16-mpg on regular thanks to an engine shut-off at stop lights. The truck rides on independent double-wishbone front suspension with coil-over shocks, and leaf springs with a solid axle in the rear. There’s cast aluminum lower control arm up front and dual blue FOX shock absorbers upsized from 2.5 to three inches in diameter with nine-stage bypass damping for improved suspension control. 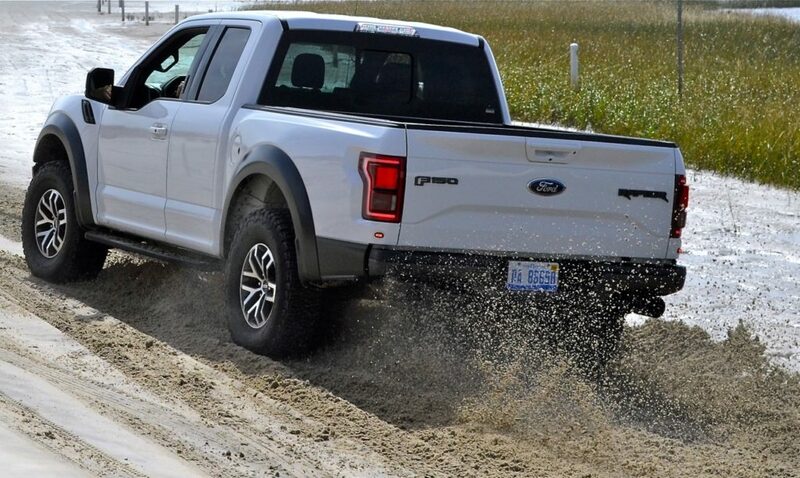 That gives Raptor 13-inch front and 13.9-inch rear suspension travel, compared to an F-150 FX4 with 7.3-inches front/9.5-inches rear suspension travel. 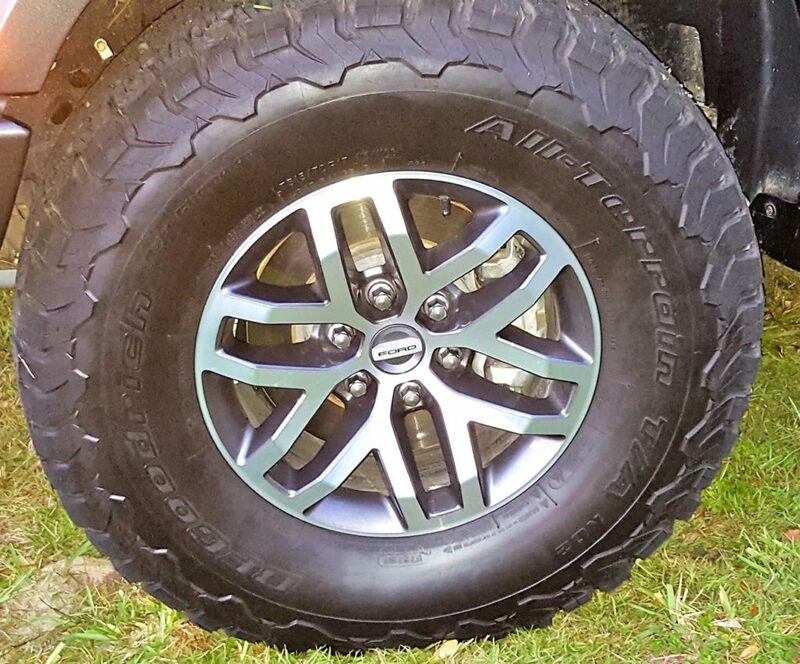 Unique BFGoodrich tires were designed for Raptor. The ride is soft and very forgiving; a bit of bounce over bumps in daily running and slight hum on asphalt from the off-road rubber’s lugs. Our Raptor actually clawed its way around curves well, a livable ride during a five-hour highway trek, offering good grip, no wander and predictable handling. Push hard into a turn and the truck takes a lean and set, hanging in. Play harder, and the front tires quickly slid in understeer, cornering limited by the rubber. There’s power galore to let the rear tires loose in a turn, but stability control helped. It’s a wide truck, and felt it on narrow roads and highways, the lane-keeping and departure systems active to nudge the rig back in line if we strayed. But that system was very intrusive in daily driving. Steering modes offer “Normal” for everyday driving, “Sport” for higher effort and more feedback, and “Comfort.” We picked “Sport” for the best daily feel, finding it firm and very direct. The disc brakes on our 15,000-mile-old Raptor had precise pedal feel and good stopping power, although the big rig dipped its nose deep with that suspension travel as knobby tires slid a bit, lengthening stopping distance. But enough asphalt – a hurricane-ravaged Florida beachfront that allows off-road driving within limits beckoned. 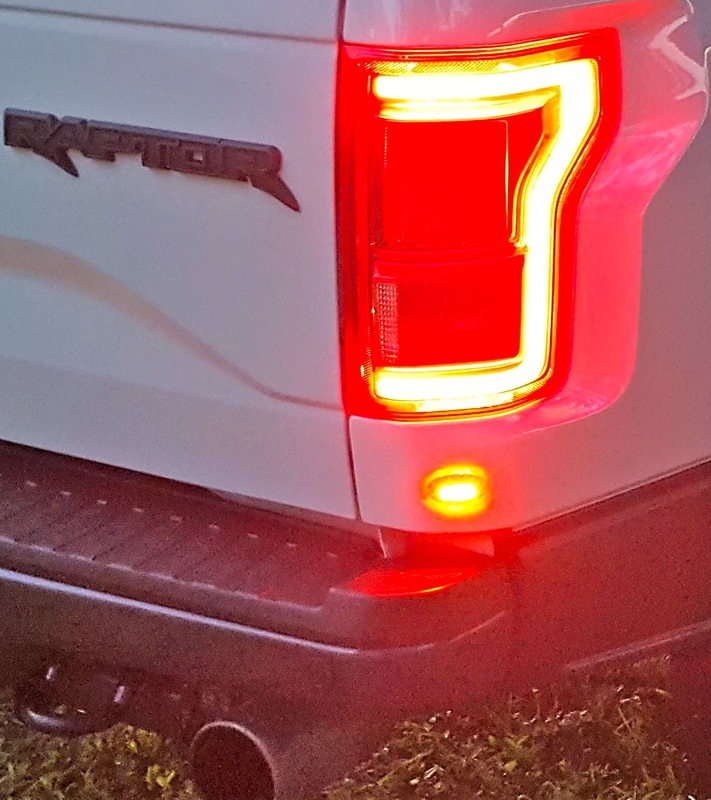 That’s where Raptor’s 11.5-inches ground clearance, 30-degree front approach angle, 22-degree breakover angle, and 23-degree departure angle came in handy. The Terrain Management System clicks between 2-, 4- and all-wheel-drive modes with specific powertrain calibrations. A dashboard knob lets the driver select rear-wheel-drive, four-wheel-drive automatic, or four-wheel-drive High and Low. There are also six drivetrain modes to control all-wheel drive and recalibrate engine, transmission, braking and stability control systems for on-and off-road performance. You get “Normal,” for daily driving with rear wheel drive, as well as “Sport.” “Weather” reduces throttle response for wet weather safety. 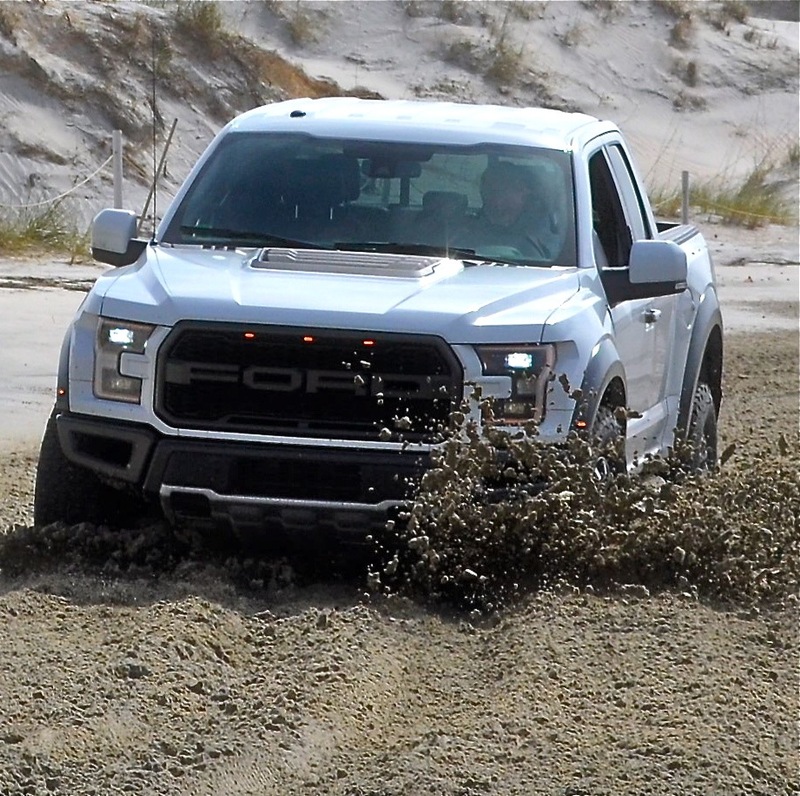 We focused beachside on “Mud and Sand,” which locks four-wheel-drive High through the transfer case for increased traction in loose surfaces, while the rear differential automatically locks. We also used “Baja,” which locked the transfer case and set up unique transmission shift and engine controls. It also kept us in lower gears longer, letting turbos spin for quick response. For other nasty stuff, “Rock Crawl” mandates low range and locks the rear differential, using additional gear reduction to provide a 50:1 crawl ratio for slow and steady hauling over the rough stuff. In “Baja” and four-wheel-drive High, we dove into the mushy soaked sand next to a lagoon, followed by smaller mini-dunes and soft sand. Run into a mogul, and massive suspension travel and Fox shocks absorbed it with barely a head nod inside. The steering never kicked back hard, and we had precise point and shoot ability to go where we wanted. The tires clawed easily through the mud, never clogging or slipping as we easily traversed slippery stuff. Raptor easily plowed through watery sand to the hard-packed low tide line without missing a step. On a bumpy dirt trail as we laid on speed, the truck just flew over bumps, with no harsh suspension or body movements. Despite our truck’s 15,000 miles, nothing rattled or creaked. 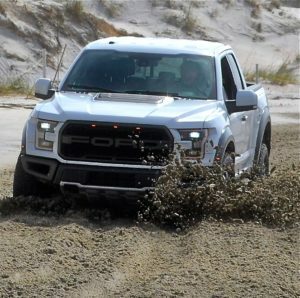 Covered in sand, design changes to the new Raptor were evident, some seen on other Ford pickups of late like C-shaped driving lights, front window cutouts first seen on SuperDuty models, and eight-side grille on a blunt, somewhat rounded nose. But our white SuperCab (four-door SuperCrew also available) model has Ford Performance mods too. There’s an evident six-inch wider track with rounded, flared fenders and large gray wheel well accents, plus redesigned front/rear bumpers. Almost two more inches of ground clearance stand on gnarly LT315/70R17-inch BF Goodrich All-Terrain rubber with five-spoke brushed alloy wheels. That big, blunt mesh grille goes gray with big “FORD” in the middle and amber LED running lights, flanked by LED headlights. The hood’s power bulge is a working vent, others incised into flared front fenders. Outer bumper sections have cutouts so the beefed-up aluminum A-arm suspension is visible inside. Both bumpers were redesigned to hug the body to improve approach and departure angles. Yellow LED lights pinpoint front fender flares and corners of the rear cargo bed, under huge LED taillights. 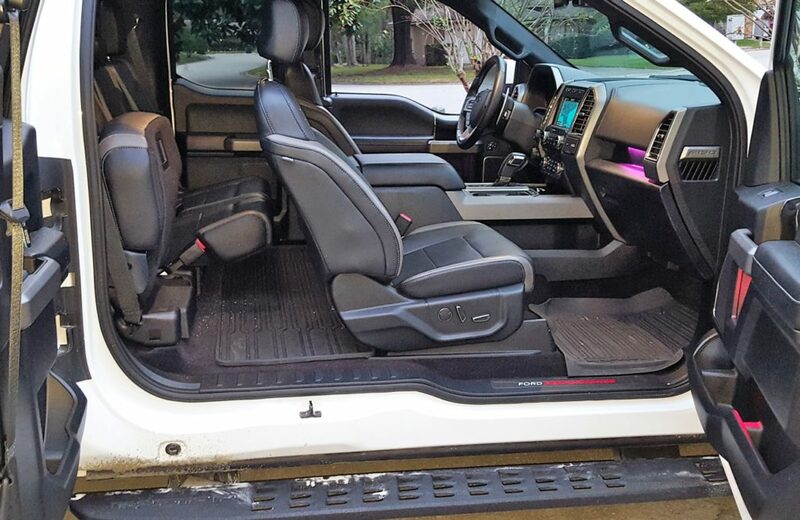 With running boards and inside grab handles to help, we lofted into the tall Raptor to settle in black bucket seats with metallic silver accents, more deeply bolstered with a very supportive feel. The driver faces 80 buttons and knobs in the cockpit, dash and steering wheel. There’s 23 alone on the leather-clad steering wheel, with a top-center red leather accent so you know when you’re driving straight off-road and two big titanium paddle shifters behind. There’s an analog 140-mph speedometer and 7,000-rpm (6,200-rpm redline) tachometer framing a large center digital screen. Dash center is the 8-inch touchscreen housing navigation, a very good Sony AM/FM/SiriusXM sound system as well as 360-degree and backup camera display. The front camera activates when you are off-road to spot obstacles, while the rear camera has an LED spotlight. The system offers SYNC 3, which allows smartphone integration to Apple CarPlay and Android Auto. More controls include four-wheel-drive selector, trailer tow bias control and the Pro Trailer Backup Assist, which lets the driver steer via the knob, cameras gauging what the trailer does as you use gas and brake. There are 12 and 110-volt outlets on the dashboard, with another set for rear seat passengers. Smart idea: six auxiliary switches overhead for aftermarket add-ons such as off-road lights. The rear bench seat is easily accessible after the front and rear-hinged coach doors are opened, and we found adequate legroom and decent headroom for two adults, even three. 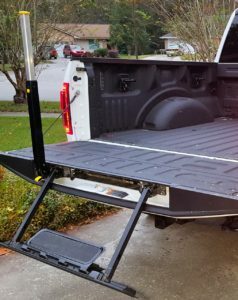 Seat bottoms fold to open up floor storage. The rear window has a power-sliding center. There’s a fold-down step integrated in tailgate, which opens at the touch of a key fob button. 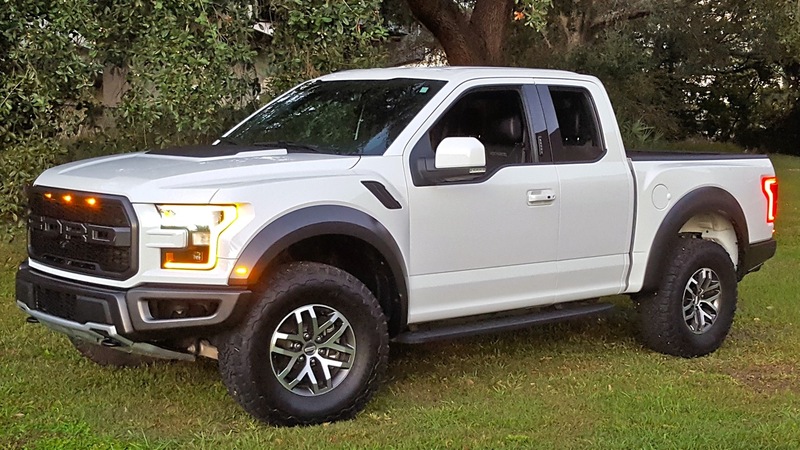 A base ‘18 Ford F-150 Raptor SuperCab starts at $49,785, while a Raptor SuperCrew starts at $52,770. 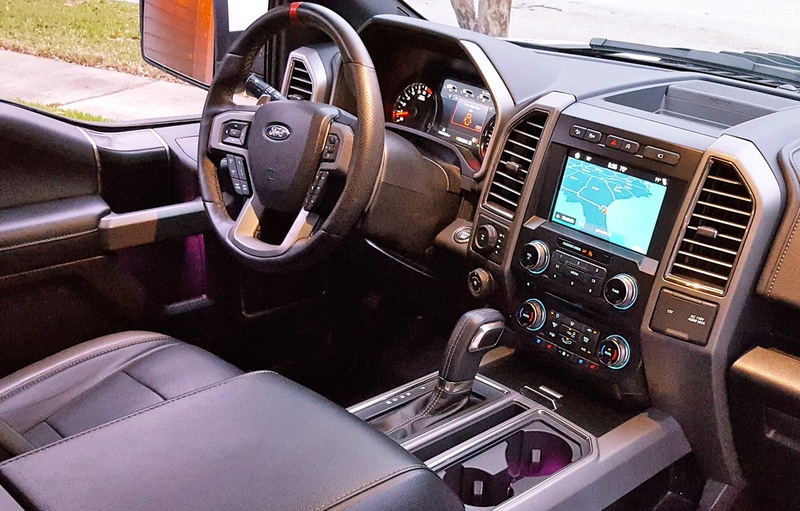 Our Raptor was loaded: $9,770 equipment group with 4.10 front axle/Torsen differential, driver’s seat memory presets and front seat heating/cooling, SYNC3, center touchscreen; SYNC Connect and Sony sound; $1,950 technology package; $495 spray-in bedliner; and $375 power tailgate with fold-out steps. Final price – $63,670. This is a super-capable off-road truck that is quite civilized.